We have had a tumultuous year with Gymnast. I don’t know if it’s the teen/puberty hormones, the move or just pure boy-ness. But this mama has struggled! I have always said he was my “high-maintenance” child. I’ve also said he hit the terrible 2’s at 18 months and I’m still waiting for them to end. Recently, a post on a single mom’s Facebook group made me realize that a lot of parents suffer in silence with just various challenges and insecurities when it comes to parenting. It’s too bad they don’t send you home from the hospital with this cute little baby and a manual! Now don’t get me wrong. I love Gymnast and am super proud of him. But he challenges me at every single turn, all the time, it is never ceasing! I’m not going to throw out all the labels people have given me over the years, but I’m sure there are parents here who can relate. I say all this to give you some background on what I’m sure will be another controversial choice I’ve made for him. Gymnast was recruited to a competitive gymnastics team several months before his 6th birthday. This would have been his 7th year competing and he was slated to move up to Level 8 (Level 10 is the highest level, think college and Olympics.) He is very good. But his training and competition has cost me a pretty penny over the years. Even though I was able to barter for a number of years for the training costs, travel and competition and uniforms, they add up. After a really rough semester of public school, I made the parenting and financial decision to pull him from gymnastics at the end of last competition season. You can read about it here. All summer, he pleaded and begged to return. And frankly, it turned my stomach to have made the choice, but I KNEW as a parent I needed to stick to my guns. Fast forward 3 months, and he returned from a month long visit to his grandparents. Still anxious to return to the gym. I had pleaded with him to try a school sport, try a team sport, trying anything else that was local. He needs the energy and physical outlet (see high maintenance above.) But he was not interested at all. We compromised at the beginning of August. I would agree to 1x a week back at the gym, he would agree to some behavioral and attitude adjustments and his coach agreed to call this a maintenance year and not require any competition. That cost me $100 per month, see the notes here. This is Gymnast first semester in a school (previously homeschooled) during football season. The hype, the pep rallies, the “football” persona won him over. And he decided to try out football. After my initial call with the coach, I told him, he could try for a week and then he would have to choose. Logistically I didn’t think he could do both. But in fact, the football team has one day off a week AND the season ends the first or second week in October. And doesn’t practice again until sometime in the spring. That would leave me with a “activity-less” Gymnast. No physical outlet for his abundance of emotions and energy. That is NOT acceptable for any of us! As a result, Gymnast is going to stay in gymnastics, going 1x per week. And he is going to play football. Well, he’ll have to earn playing time. 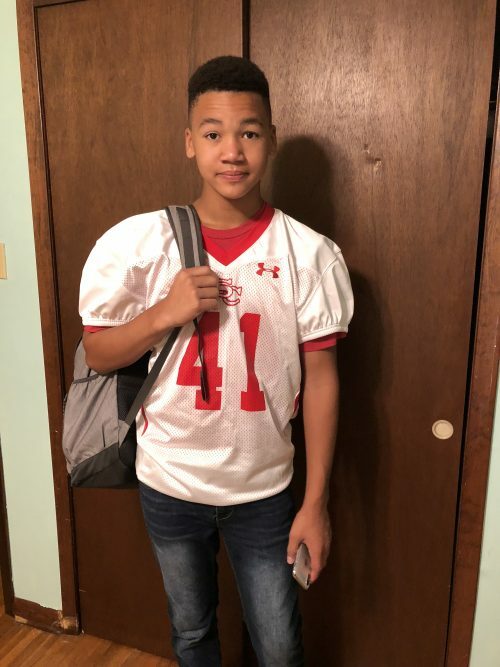 And the learning curve will be steep seeing as he had never even seen a football game before attending last week’s middle school game. But he will work out and be apart of the team. And we will see what happens. I had to invest in a pair of cleats and girdle for football, and my monthly cost for gymnastics remains $100. I realize many BAD readers disagree with my spending money on kids’ activities when I’m in debt. In reality, we have cut back tremendously! But eliminating them completely is just not worth it to me for a variety of reasons. Did/do you find some “extra” kid expenses to be non-negotiable even when climbing out of debt? Hope, I am not sure I would have given in re the gymnastics … @ $100 per month — wow. Well, maybe I would have it your son had made it his responsibility to pay that $100. There are so many things to do at school after football season that would NOT cost $100 per month. Many fall soccer and football players do track in the winter, or basketball. Regular track includes hurdles and high jump and shotput, etc. — so much to use up all that energy! The other benefit to school activities is they keep him engaged at school with the kids and coaches and that will help him socially, I think. I agree, unfortunately, track season does not start until the spring here. And he’s not interested in basketball at all. Winter sports are really limited. I have a feeling gymnastics is going to fall off the radar completely, but for now, this is our plan. Oh yes, I get it! One of our boys needs (and we need it too, lol) to release physical energy every single day. At age 7 he chose karate, which I’d say is a middling expensive sport. He doesn’t like to compete so we’ve thankfully never had that expense. Now he’s a senior and for over a year has instructing some of the karate classes in return for a nice discount on his own training. We did make financial sacrifices to keep him in training; we’ve made sacrifices for all of our kids. Somehow you do what you need to do and balance it all the best you can. Paying debt isn’t more important than providing for our kids, it’s just one of the things we, and many families, must carefully consider when making a decision. You’re doing great Hope. The decisions you’ve made regarding Gymnast seem fair and balanced to both what your child needs and to your financial goals. He’s going to be fine with you guiding him! Thank you, Mia. It’s always nice to have reassurance that I’m not alone when making these types of decisions! Could he help teach gymnastics to younger students to either make money, or as a trade off for his training costs once football is done? Maybe, but it’s an hour drive each way to the gym, so doesn’t really make sense financially to add that. Especially since I have Princess in local sports. The compromise of 1x a week meets all the needs at this point. I know this is a bit off-topic, but is that Gymnast’s super-fancy iPhone in his hand? You don’t have to answer if you don’t want to bring this back up, but I’m just curious how that’s gone. Has he remained as infatuated with it after the purchase? Does he have any regrets about it? I ask as a mom of little boys who will some day grow into teenage boys and force me to make tough decisions (heaven help me…). Is it in a case too? Wouldn’t want it to get broken! He’s already on his second case…a friend broke his first one. But he’s definitely taking better care of it. I think through all of this he realizes that mom is not bailing him out anymore. It is and he has! I haven’t heard a single word of regret at all. It has really amazed me. He did get “grounded” from it for a week and had a fit because he “bought” it. I said he could keep it but I would discontinue the service and change the Wifi password so it would be a door stop. I am going to have to ask him if he has any regrets, but I don’t think he does. I do think he’s surprised that people don’t think it’s as big a deal as he does. But I don’t think he would make a different decision if he could do it again. I will have to ask him. Will keep you posted. I think the gymnastics once a week is a good compromise. I also think keeping it up could really help with his college admissions and financial aid. I’m glad you allowed him to return to gymnastics because it sounds like more than just a way to burn off energy. In fact, it sounds more like a career track and something he truly loves and needs. I hope your finances improve enough that he can return to competing. So can you remind us why you moved to the little tiny town? It’s been a really consistent theme that it doesn’t offer much for your family and that you have to drive a long distance for enrichment/sports stuff and to work on your business because there isn’t much local business for you. And you can work anywhere…..do you stay because the rent is affordable? Have you considered making a move that might be a better fit for your family? Good question. We originally moved here for two reasons: 1) substantially lower cost of living and 2) we have a great deal of extended family in the area. At this point, I am not considering moving again. Princess is particular wants to complete high school here and ask asked that I “promise” to try not to move again before she graduates (2021.) The cost of living is great here. And while we do have to venture outside of our tiny town about once a week (barring more gymnastics training,) everything else is here. We have stable, safe housing. We do have family close by, even though we don’t see them a great deal, other than my grandmother. And both of the younger kids have settled in nicely. It’s starting to feel like home. Sea Cadet will finish his Advanced EMT certification next August. And then he will mostly likely move away. I hope this rambling reply answers your question. That makes sense and now that the kids have made friends I can see why you’d want to stay at least through grad….I was just curious. At least the lower cost of living should help keep the bills reasonable, right? terms of resources. (especially since you have admittedthis is the weakest area of your budget game.) I also realize princess is kicking in for camp but have to wonder how realistic it is for her to work, maintain grades and commit to intramural sports. You have said that if she isn’t able to save the $175 that you will commit and get it from her later. Have you all had a sit down and discussed the time commitment you expect to see for each of these things? ($175 seems very doable but I know from my own past experiences that my grades suffered when I held down a job as a teen.) Work life balance is tricky even for adults and Princess is not an adult yet. .edu sure she is not over extending herself. I think its odd that when Gymnast had money and wanted a $1,000 iphone you said it was his money to spend, but now that he wants his expensive sport back its all on you. I think you should make him pay some of his costs with his birthday money etc that he gets in the future if he wants to continue to participate. I am glad to hear he is back in gymnastics. Of all the decisions you have made, I thought removing him from gymnastics was the worst. Gymnastics was great for his self esteem plus I saw it as an opportunity to go to college with a four year scholarship. I would nix the football and put him in gymnastics regadless of whatever else needs to be done. I would hate to see him throw that away at his level. Just a thought.